Russia's workhorse rocket failed shortly after the launch from Kazakhstan. A Proton/Breeze M rocket, carrying the JCSAT-11 comsat for JSAT Corp. of Tokyo, Japan, blasted off from Pad 39 at Baikonur Cosmodrome on Sept. 6, 2007, at 02:43 Moscow Time (Sept 5, 2007, 22:43 GMT). Khrunichev enterprise, which manufactures Proton rockets, announced on its web site that the failure had taken place during the burn of the second stage. According to Talgat Musabaev, representing National Aerospace Agency of Kazakhstan, in-flight telemetry recovered after the launch had indicated a failure of a gimbal mechanism, which steers engines; thus leading to a premature shutdown of the propulsion system of the second stage. Unofficial reports surfaced on the Internet several days after the launch said that all four steering mechanisms on the second stage had started functioning properly but later failed. According to the Russian media, search for the wreckage of the vehicle was taking place in Kazakhstan, downrange from Baikonur. The crash site was located 40 kilometers southwest of town of Dzhezkazgan, in the Ulytau District, Karaganda Region, according to officials from the Ministry of Emergency Situations, MChS, who were quoted by the Interfax news agency. According to sources in Kazakhstan, the failed rocket impacted in an uninhabited area, resulting in explosion and several fires in the grasslands, however it caused no casualties or property damage. Kazakh sources placed the crash site at 47 degrees 33 minutes North latitude and 67 degrees 19 minutes East longitude. A disinfecting group arrived to the impact site, discovering two or three fragments estimated at 400 kilograms in mass, according to Kazakh officials. It was estimated that at the moment of the crash, the remnants of the rocket still contained 218 tons and 979 kilograms of toxic propellant. The main impact crater was estimated to be 20 meters deep and 45 meters in diameter. As it happened in previous launch accidents, Kazakh government had imposed a formal ban on future launches of the Proton rocket. As of Sept. 7, five fragments of the rocket exceeding half a meter in size were discovered. Kazakh officials reported that soil samples had been taken from the crash site for analysis of the environmental impact. By Sept. 10, RIA Novosti reported the discovery of 22 impact sites attributed to the accident. Around 20 fragments were reported near the main crash site. Also on Sept. 7, Viktor Khrapunov, the Minister of Emergency Situations of Kazakhstan confirmed that a failure of the steering mechanism in the engine No. 2 caused the accident. On Sept. 11, 2007, Russian Prime Minister Mikhail Fradkov ordered creation of the investigation commission, which would be headed by the head of the Russian space agency Anatoly Perminov. On Sept. 12, 2007, press-service of the Ministry of Emergency Situations of Kazakhstan said that the search operations at the crash site of the Proton rocket had been completed. Total 70 fragments of the rocket, four craters and seven sources of fire had been attributed to the accident. Prior to the latest failure, the Proton family of rockets had successfully completed only six missions -- one was the older Proton-K rocket and five were Proton-M launches. These missions followed another botched launch on March 1, 2006. 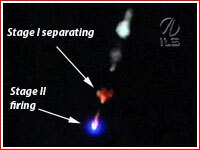 Proton vehicle carrying the JCSAT-11 satellite, determined that a damaged pyro firing cable on the interstage truss prevented the activation of the pyro bolts that were to have separated the first and second stages of the rocket. Anatoly Perminov, head of the Russian Space Agency (Roscosmos) and chairman of the 18-member investigative commission, announced the findings after meeting with government officials in Kazakhstan. Proton launches will resume with a Glonass satellite mission for Roscosmos. Russian commission. ILS Vice President and CTO Jim Bonner, Chairman of the FROB, said, "I am very confident that the Russian State Commission was able to conclude its investigation thoroughly and in a timely manner. Having not only telemetry, but recovered hardware from the vehicle itself certainly facilitated the investigation and conclusions." investigation and corrective actions, ILS commercial launches could resume as early as mid-November. The 4,000-kilogram multipurpose JCSAT-11 satellite was built by Lockheed Martin and it was based on the A2100 AX platform. The satellite was expected to serve as a backup in the JSAT fleet, capable of providing communications throughout Japan, the Asia-Pacific region, Oceania and Hawaii over next 15 years. The spacecraft carried 30 active Ku-band transponders and 12 active C-band transponders. To insert the satellite into its 35,786 by 5,032-kilometer separation orbit with the inclination 21.4 degrees toward the Equator, the Briz-M upper stage was expected to fire four times. In the nominal flight, the upper stage and the payload would separate around 6 hours 56 minutes after the launch. It was the 327th launch of the Proton rocket. The contract for this mission was announced on Feb. 7, 2006 with the launch originally expected in the third quarter of 2007.